Keep your expensive activewear performing just the way it should! Double Clean washes out dirt, sweat, odor and old detergent residues. It's clean-rinsing formula make the technical fibers of certain activewear work again, keeping you drier and more comfortable. Double Clean contains no harsh chemicals preventing premature break down of clothing fibers and fading of colors. Safe and effective for all washable fabrics, Double Clean leaves no harmful residues to irritate your skin. This fragrance free, gentle cleaner enhances the performance of apparel such as Drymax© and Gore-Tex. 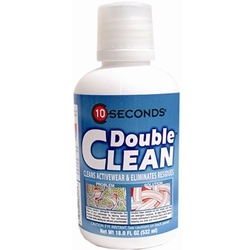 Double Clean will not clog the breathable pores of products with a durable water repellent finish. Contains no phosphates and is biodegradable. This 18-ounce bottle cleans 18 loads of laundry.